A healthy slow cooker freezer meal that's perfect for a cool fall evening! Serve with a crusty loaf of bread and some steamed veggies for satisfying and nutritious dinner! Enjoy a wholesome homemade supper — even on your busiest weekdays — by stocking your freezer with Crock Pot dinners! 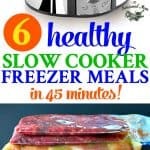 In just 45 minutes you can prepare 6 Healthy Slow Cooker Freezer Meals to keep on hand for those nights when you need them most! This is the ultimate way to simplify your life…and I’ve even included my free printable shopping list. It’s that time again! With Back to School season in full swing, I knew that I better prep ahead and stock my kitchen with plenty of healthy slow cooker freezer meals that I could turn to for those crazy evenings when I won’t have time to cook. Are you familiar with Crock Pot freezer meals? 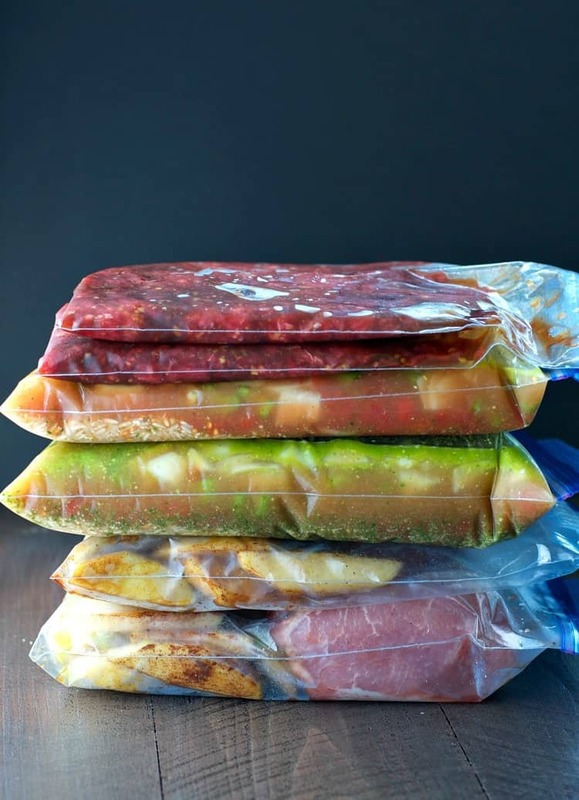 Basically, all you do is toss some RAW ingredients into a large zip-top freezer bag, label it, and stick it in your freezer. When you’re ready to make your dinner, just thaw the bag in the refrigerator overnight and dump the contents into your slow cooker the next day. Let the Crock Pot do the cooking and dinner will be waiting for you when your troops are hungry! 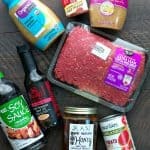 For this particular batch of freezer meals, I selected 3 healthy slow cooker freezer meals that I knew my family would love. When I pull together these menus, I make a point to choose recipes that use a variety of meats and that offer a nice variety of meals. For instance, you don’t want to end up making 6 chicken dinners (boring!) or 6 different soups. I printed the recipes for my Healthy Slow Cooker Freezer Meals and prepared a shopping list based on DOUBLING each recipe. That way I get two separate dinners with about the same amount of prep time. You can download a printable PDF of the complete grocery shopping list for 6 Healthy Slow Cooker Freezer Meals HERE. When I returned from the grocery store, I didn’t even bother to put away the food. 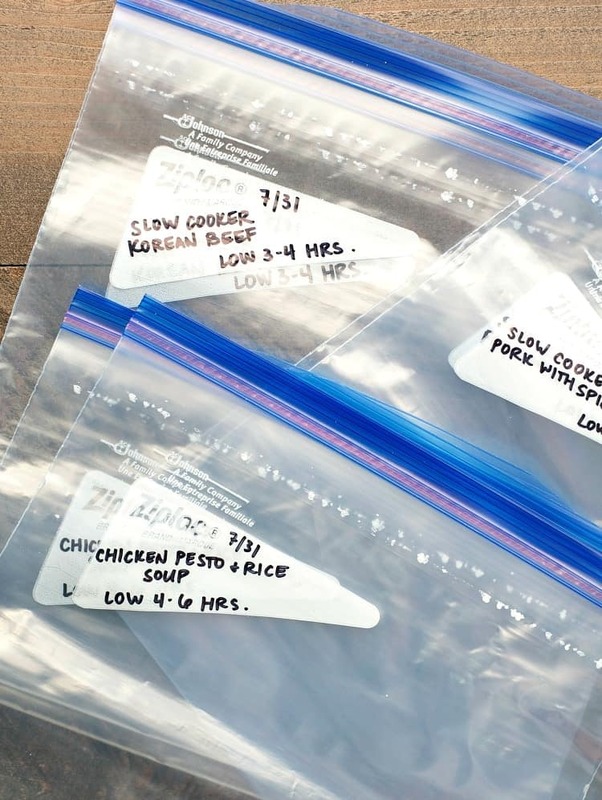 Instead, I labeled my zip-top freezer bags (with the name of the recipe, plus the cooking instructions), chopped my veggies, and tossed the appropriate ingredients into each bag. 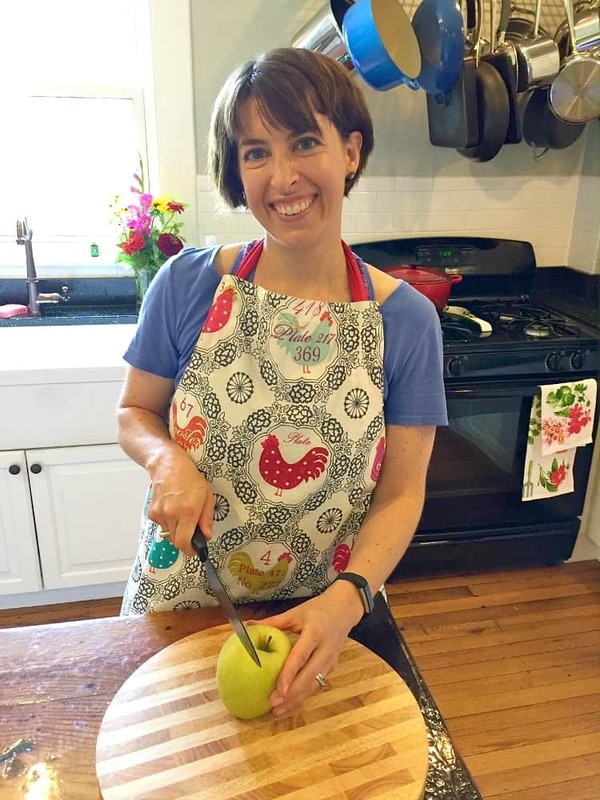 I actually set my timer to see exactly how long it would take me to make all of these dinners and I was VERY pleasantly surprised to see that I was completely finished in 45 minutes (and that included a couple of interruptions from the little ones!). With a few more minutes of clean-up, my kitchen was spotless and my freezer was full in under 1 hour! 1. Slow Cooker Pork with Spiced Apples: A healthy slow cooker freezer meal that’s perfect for a cool fall evening! Serve with a crusty loaf of bread and some steamed veggies for satisfying and nutritious dinner! Season pork with salt and pepper. Spray slow cooker with nonstick cooking spray. Place pork in bottom of slow cooker. 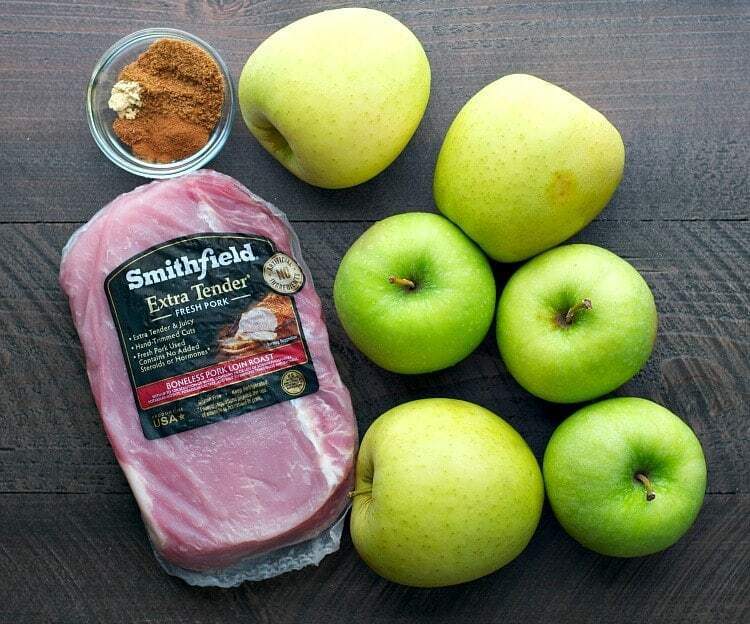 Top with apples, sprinkle with sugar, cinnamon, nutmeg, and ginger. Cover and cook on low for 4 hours. Slice pork and serve with applesauce on top. FREEZER OPTION: Place sliced apples in a large zip-top bag. Sprinkle with sugar, cinnamon, nutmeg, and ginger and toss to coat. Season pork with salt and pepper. 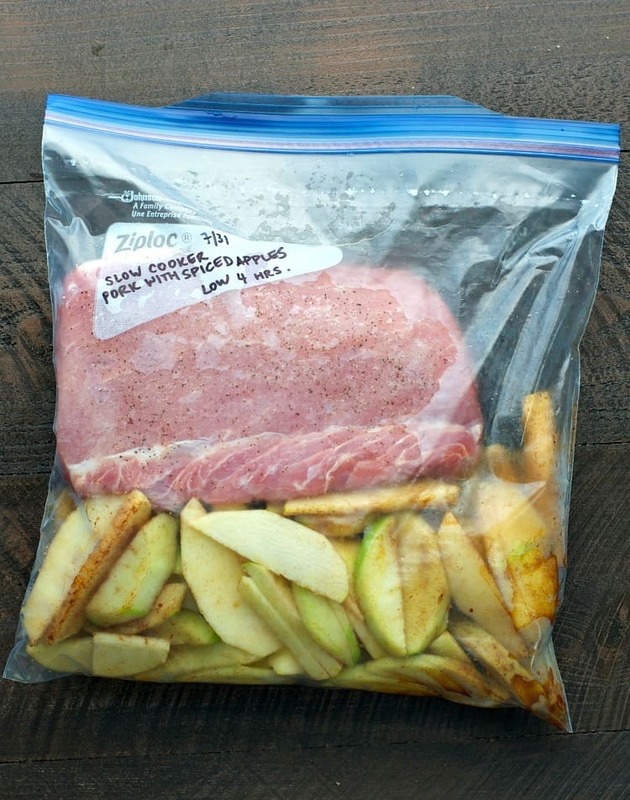 Place pork in the bag on top of the apples. Squeeze all of the air out of the bag, seal, and place in the freezer. 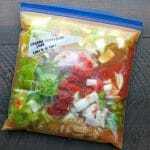 When ready to cook, thaw the bag in the refrigerator overnight. Spray a slow cooker with nonstick spray. 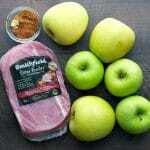 Dump contents of the bag into the slow cooker (pork should be on the bottom with most of the apples on top). Cover and cook on low for 4 hours. Slice pork and serve with applesauce on top. 2. 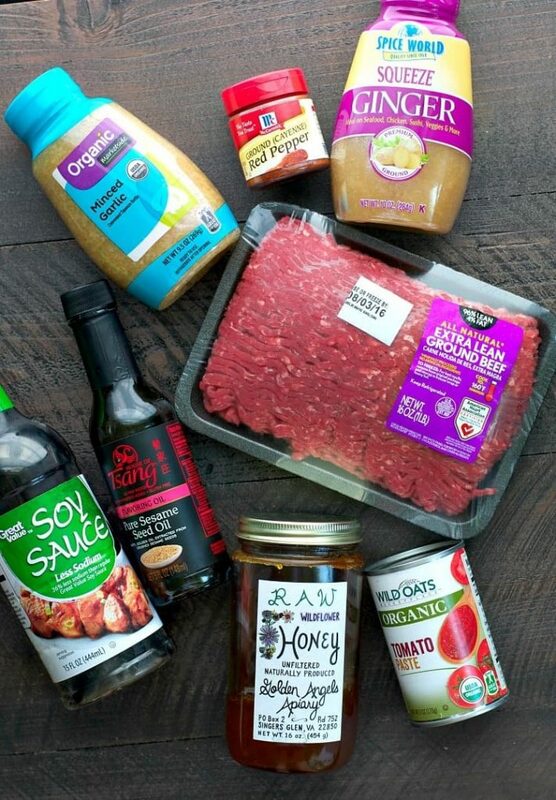 Slow Cooker Korean Beef: One of our favorite healthy slow cooker freezer meals! I love to make lettuce wraps with this beef, but my boys think it’s delicious rolled up in tortillas…taco style! I love to make lettuce wraps with this Slow Cooker Korean Beef, but my boys think it's delicious rolled up in tortillas...taco style! Whisk together all of the ingredients except for the beef. Place raw beef in slow cooker, breaking into chunks with a spoon or with your fingers. Pour sauce over the beef, toss, and cover. Cook on low for 3-4 hours. 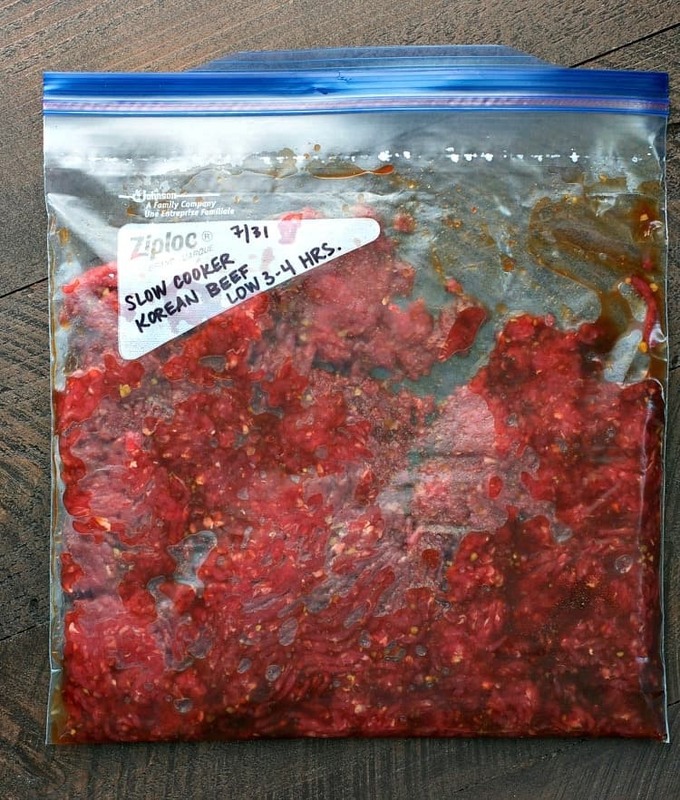 FREEZER OPTION: Place raw beef in a large zip-top bag and break apart into chunks with your fingers. Pour sauce over the beef, squeeze out the air from the bag, and freeze until ready to use. When ready to cook, thaw in refrigerator overnight. Then dump all of the ingredients into your slow cooker, cover, and cook on low for 3-4 hours. Serve beef with sauce in lettuce wraps, over rice, or in tortillas. Garnish with sliced green onion and/or sesame seeds if desired. 3. Slow Cooker Chicken Pesto & Rice Soup: With veggies, protein, and grains included, this is the ultimate cozy and healthy slow cooker freezer meal! With veggies, protein, and grains included, this is the ultimate cozy one pot meal! Remove chicken, shred or dice the meat, and return to the slow cooker. Serve in individual bowls and garnish with Parmesan cheese. 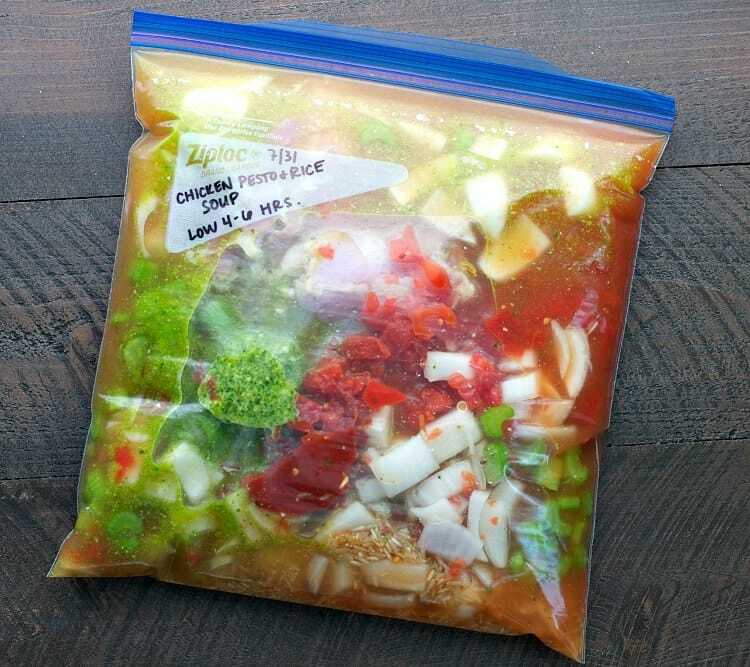 FREEZER OPTION: Place all ingredients in a large zip-top bag. Squeeze all of the air out of the bag, seal, and place in the freezer until ready to use. 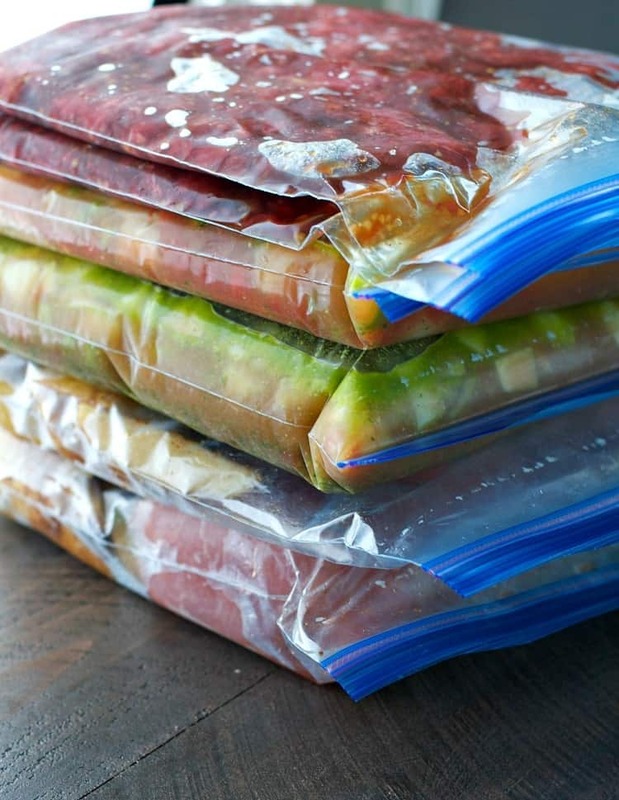 When ready to cook, thaw in the refrigerator overnight. 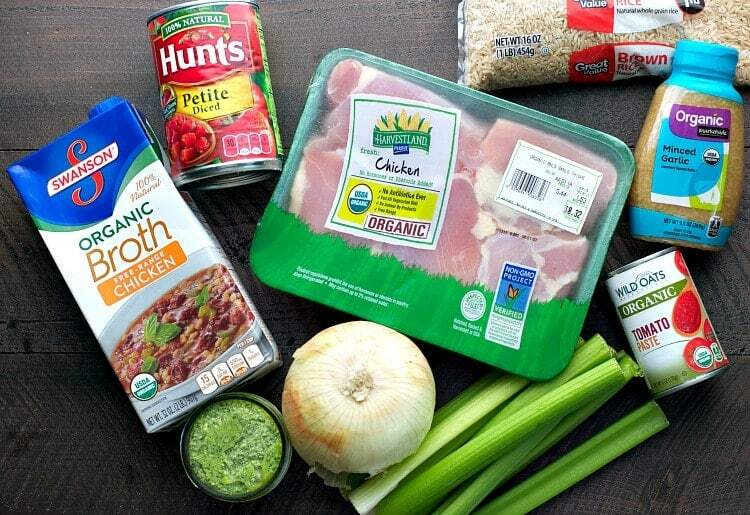 Dump all of the ingredients from the bag into a 6-quart slow cooker. Cover and cook on low for 4-6 hours. * Remove chicken, shred or dice the meat, and return to the slow cooker. Serve in individual bowls and garnish with Parmesan cheese. *Depending on how hot your slow cooker runs, 4 hours may not be enough to fully cook the rice. It's safest to plan on at least 6 hours, but if you have a relatively cool Crock Pot it could take more like 6-8 hours. And that’s it! I lay the bags flat to freeze them so that they don’t take up too much space. By doubling each of these delicious recipes, I’ve got 6 healthy slow cooker freezer meals ready to go in a very short amount of time! I LOVE this Blair! 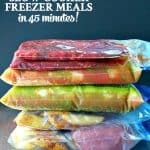 I’ve never actually made freezer meals before, so I definitely need to start, especially since these are so easy! And this is such a time saver, too! I’m definitely trying that chicken pesto soup. Love this! Wow, Blair, what a great post! It never occurred to me to do freezer bags for the crock pot. I’m embarrassed to admit that I just started using a slow cooker this summer, lol. I am still a newbie but I truly appreciate the time saver especially for soups and stews. Sharing all over! Love this! Thanks so much for your kind words, Robyn! Slow cooker meals can be kind of hit or miss in my opinion, but once you figure out what works it’s SUCH a lifesaver! I would love if you shared it in your eBook! Thanks so much! All of these meal ideas look delicious! Freezer meals are definitely a must for those crazy busy nights! Hi, Kim! Yes, I do think it would work. It might be a bit dryer than the loin, but if you serve it with plenty of the sauce/apples it should be good to go! You might also need to keep an eye on the cooking time, since tenerloins are often longer and thinner than a loin. If it’s not as thick, it will probably cook faster, so you might only need 2-3 hours in the pot. Hope that helps! This looks fantastic, i just have a question. When you say “cover and cook” do you mean cover the ingredients with water or liquid? I was really looking forward to the pork with spiced apples, however, 5 hours later the pork is nowhere close to done and the apples did not break down into an “applesauce”. I turned it up to high in hopes I can salvage the roast for at least leftovers for lunch. Looks like we’ll be going out to eat tonight. Hey, Sheri! That’s really odd! I’ve made the dish a number of times (and so have other readers) without any issues. Since I didn’t see you make it, I don’t know what the problem could have been…was the pork larger than the recipe instructed? Was it still frozen, rather than thawed in the refrigerator? Was your slow cooker not working properly? Also, slow cookers can vary drastically by make/model when it comes to the temperature that they cook on. Maybe something else? Wish I knew the answer, and I’m sorry that it wasn’t a success. I loved the recipe slow cooker korean beef, however, I was left with a doubt. Is not it necessary to add water to this recipe? If yes, how much? Hi! No, you don’t need to add any water to the Korean Beef. The condensation from the pot will drip down as it cooks, adding plenty of liquid to the dish. Enjoy! Look delicious! I’m having trouble finding 97% lean ground beef for the Korean beef. Could I use 90% and cook it and drain the fat before adding to the crockpot?